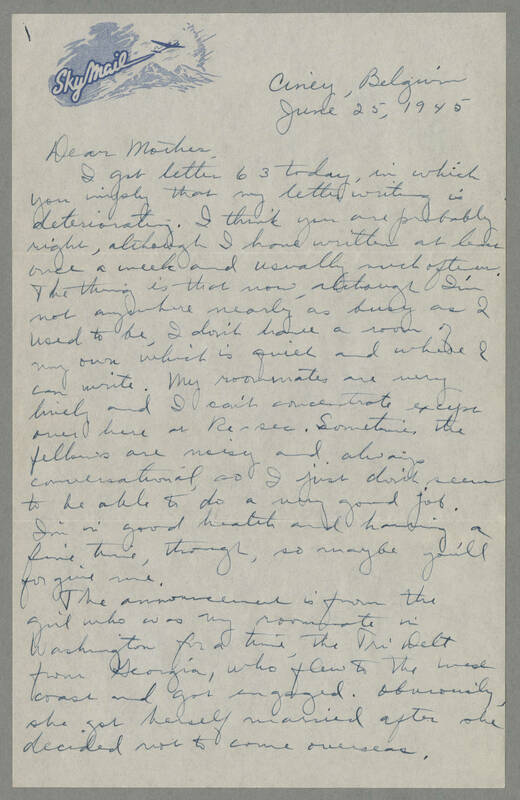 Ciney, Belgium June 25, 1945 Dear Mother, I got letter 63 today, in which you imply that my letter writing is deteriorating. I think you are probably right, although I have written at least once a week and usually much oftener. The thing is that now, although I'm not anywhere nearly as busy as I used to be, I don't have a room of my own which is quiet and where I can write. My roommates are very lively and I can't concentrate except over here at Re-sec. Sometimes the fellows are noisy and always conversational, so I just don't seem to be able to do a very good job. I'm in good health and having a fine time, though, so maybe you'll forgive me. The announcement is from the girl who was my roommate in Washington for a time, the Tri Delt from Georgia, who flew to the west coast and got engaged. Obviously, she got herself married after she decided not to come overseas.